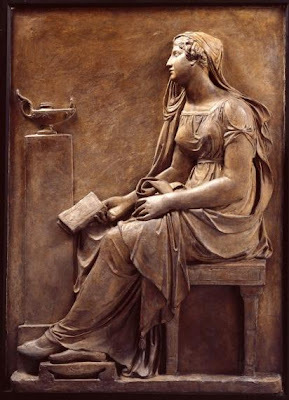 This relief is the model for a monument to Mrs Robinson, which Gibson made for St. James' Cemetery Chapel, Liverpool at his own expense. The original marble is now in the Walker Art Gallery, Liverpool. I saw this marble in the Walker Art Gallery many years ago. I was a regular visitor there when I taught at the Liverpool School for the Deaf. I'm so grateful for all art on the Web - things I wouldn't know of otherwise - but seeing things in real life is of course the best way to learn about art.